The “Cahow Cam Project” has soared since being officially launched on Earth Day [Apr. 22], attracting hundreds of viewers to its video posts on Bermuda’s critically endangered national bird. A joint initiative between Ascendant Group Limited, the Ministry of Environment & Planning, LookBermuda/LookFilms and North Rock Communications Ltd., the long-planned project is online and available for all to get a close look inside the nests on Nonsuch Island Nature Reserve. A new report uploaded last night [Apr. 28] features Terrestrial Conservation Officer Jeremy Madeiros explaining the growth cycle of a five-week-old Cahow chick. LookBermuda’s Jean-Pierre Rouja developed the Cahow Cam project in consultation with Jeremy Madeiros and the department of Conservation Services, as a follow-up to their successful film on the Cahow Translocation Project which was released in March, 2011. The Bermuda Petrel, commonly referred to as the Cahow, is Bermuda’s national bird. It is a pelagic seabird, which means it spends most of its life out on the open ocean. They feed on small squid, fish and shrimp, returning to land only to breed. 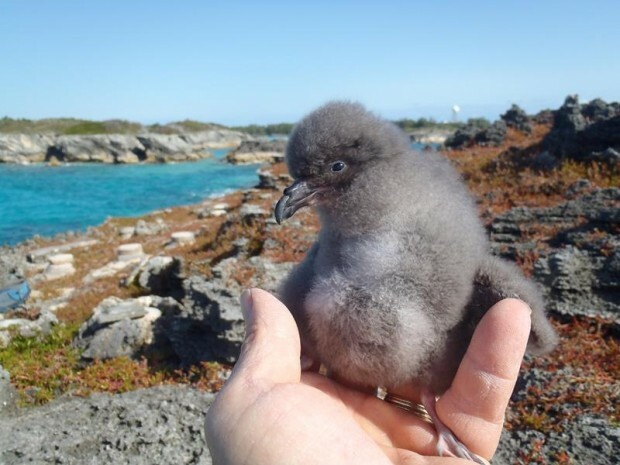 The population is now up to 104 breeding pairs nesting in underground, rabbit-like burrows on a few of Bermuda’s most remote, uninhabitable islands. Although the Cahow nesting population is increasing at the moment due to intensive management action and the control of threats, it is at this point still one of the rarest seabirds on the planet, listed as endangered on the international Red Data List. Anyone who wants to see nesting Cahows can visit the LiveStream page here. For the next several months, footage will be recorded and posted to the site. Later in 2013, a new installation of solar panels on Nonsuch Island, funded and installed by Ascendant Group, will power the cameras 24 hours a day, along with the required networking equipment so that live footage can be streamed via North Rock Communications. This same footage will also be able to seen on a new display which will be mounted at the Bermuda Aquarium, Museum & Zoo. To accomplish this LookBermuda uses miniature , high-definition video cameras, that they customised to be infrared-sensitive and paired them with their custom built military-grade invisible infrared lights. North Rock is providing the latest wireless technologies to stream live video from the islands to the Web, when the solar power installation is complete. I think this is fantastic, and the group under Mr. Jeremy Madeiros, deserves an award for this. Good luck and keep it up.